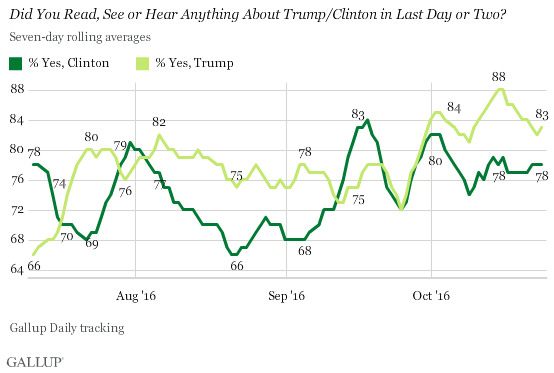 Americans continue to be more likely to report having read, seen or heard something about Donald Trump than about Hillary Clinton. This is not new -- from July to the present, 78% of Americans report having heard something about Trump in the past few days, compared with an average of 74% who report having read, seen or heard something about Clinton. For the seven days ending on Oct. 24, 83% of Americans had read, seen or heard something about Trump, with 78% having done so about Clinton. As shown in the accompanying chart, Trump's ability to edge out his opponent in respondents' minds on a daily basis has seen a few exceptions. The public's recall of news about Clinton surged just after the Democratic convention, and again when she stumbled at a Sept. 11 memorial service and soon after announced that she had pneumonia. Otherwise, Trump has continually either tied Clinton or held the upper hand in the public's news consciousness. Trump was most in the news -- with an 88% recall average -- during the seven-day periods ending Oct. 15 and Oct. 16. Clinton's highest seven-day average was 84% for the seven-day period ending Sept. 18. The graph below displays the combined recall average for Trump and Clinton using seven-day rolling averages and provides a good read on the general level of attention Americans have been paying to the election over the past four months. Prior to September, the pattern of attention to the two candidates was fairly clear: a rise during and just after the party convention period, with a decline thereafter. 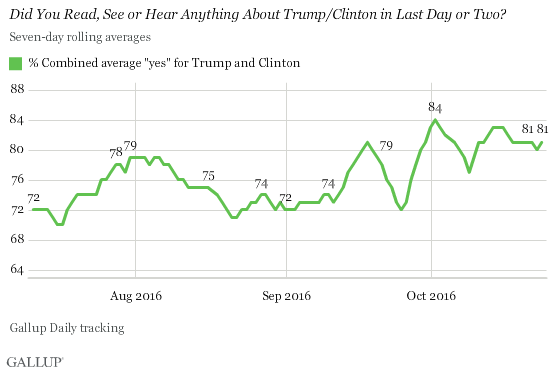 By mid-September, however, Americans' recall of having read, seen or heard about the two candidates began to exhibit a more seesaw pattern. There was a sharp rise after Sept. 11 based mainly on the aftermath of Clinton's near collapse at a memorial ceremony and her announcement thereafter that she had pneumonia. Attention fell after that point, only to rise again just after the initial presidential debate held on Sept. 26 to its highest point to date. Attention then fell once again before rising after the Oct. 9 debate. Recall since the second debate has leveled off, without the same type of uptick after the Oct. 19 debate as occurred after the first two. 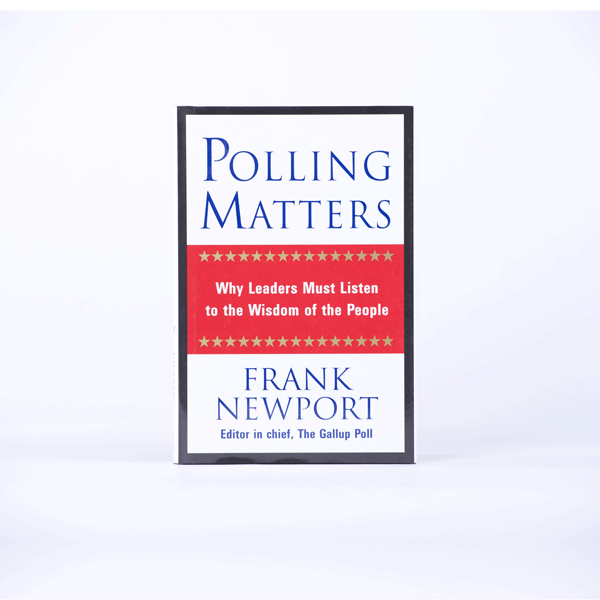 These averages confirm that Americans begin to pay more attention to the political campaigns after Labor Day, at least based on this measure of self-reported recall of having heard something about the two candidates on a daily basis. The results also suggest that the debates generate more attention than the two party conventions in the summer. What is it that Americans have been reading, seeing or hearing about the candidates? The following sections review the words used by Americans on a daily basis since Oct. 19. Oct. 19: The word "woman" continued to be the word used most frequently by Americans when describing what they recently read, heard or saw about Donald Trump. Its use is in reference to either the Access Hollywood "hot mic" tape that became public earlier this month or to one of the women who has recently accused Trump of sexual assault. Indeed, the words "sexual" and "assault" were among the 15 most commonly used words for this day. But another issue associated with Trump also percolated through to the public: The words "election" and "rig" were the second- and fourth-most-commonly used words, respectively. Americans overwhelmingly used the word "email" when describing what they had read, seen or heard about Hillary Clinton on Oct. 19. Earlier in the week, WikiLeaks had released hacked emails from a prominent Democratic official that contained parts of speeches made by Clinton to Wall Street firms. The words "leak" and "WikiLeaks" were the third- and fourth-most-commonly used words to answer this question. The word "debate" was the second-most-common word U.S. adults used when describing what they recently heard about Clinton. 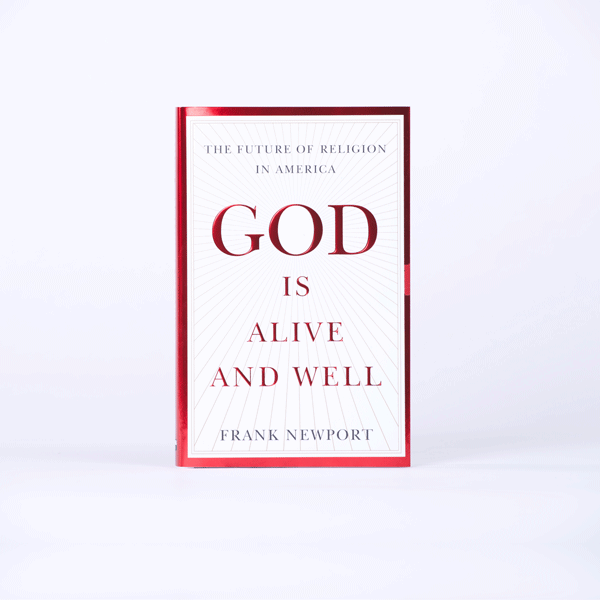 Oct. 20: On the night of the third and final presidential debate, the word "debate" was, appropriately enough, the most common word Americans used to describe what they recently read, heard or saw about both Trump and Clinton. Oct. 21: Again, Americans were using similar language when citing what they recently saw about Clinton or Trump: "Debate" and "dinner" were the most common and next-most-common words used by Americans to explain what they recently heard about Trump or Clinton. "Dinner" was a reference to the Alfred E. Smith Memorial Foundation Dinner, a charity event held in New York City at which both candidates made their best attempts at stand-up comedy. Oct. 22: Trump's refusal to state whether he would accept the results of the presidential election at the third presidential debate was the most common incident Americans referred to when recalling what they had heard about Trump on Oct. 22. The words "debate" and "election" were most heavily used; the word "accept" was also among the most frequently used words. "Debate" was also the most common word used in reference to Clinton. Most Americans who broached this topic simply said they saw Clinton in the debate. However, "email" retained its spot near the top of the list. Oct. 23: By Sunday, respondents were torn in many different directions when talking about Trump. Many brought up the multitude of sexual assault accusations made against him ("woman" was the most commonly used word), but quite a few referenced the third debate and, in particular, the comment by Trump about whether he would accept the election's results. The words "debate" and "election" were the next-most-frequent words. A few respondents mentioned Trump's speech in Gettysburg, Pennsylvania. The word "email" returned to the top of the list for Clinton on Oct. 23, followed by "debate." Oct 24: Americans continued to regularly bring up one of two topics when discussing Trump -- the allegations against him (or more generally his attitude toward women) and his talk of a rigged election. The top words used for the day were "woman," "election" and "sue." "Rig" was also among the most commonly used substantive words. When thinking about what they recently heard about Clinton, Americans most commonly used the word "email." Related to this issue, the word "WikiLeak" was the fourth-most-used substantive word in these answers. The word "campaign" was the second-most-used word; respondents using this word typically said where they saw Clinton campaigning. The word "debate" was the third-most-common word, indicating that Clinton's debate performance was still on the top of some Americans' minds. These results are part of a project conducted by the Gallup, Michigan and Georgetown Working Group, which also includes Michael Traugott and Stuart Soroka at the University of Michigan, and Lisa Singh at Georgetown University.